He stepped out of the bustle and heat of the plaza into the cool air of the restaurant. The maître d’ raised his hands in protest. “I’ll take a glass,” said Calvi, with a nod of thanks, and the maître d’ was away. The glass arrived, the cool water soothing his dry throat, and he placed his phone on the table, his fingers gently tapping as he waited. It was a few minutes before he picked up the phone. He swooshed through the applications, and tapped a logo with four letters under it. BOTS. The bots appeared on the screen. A collection of tiny robot creatures nestled in a box. With a single tap of his finger, Calvi stirred them into life. Up they rose, forming a chain as they helped one another out of the container. Their new surroundings appeared on the screen, huge walls, giant cobblestones. Calvi’s little bots were lost in the land of the giants, awaiting his instructions. He paused for a moment and flagged down a passing waiter, asking for a coffee while he waited but declining the menu for the moment. Order made, he returned to his screen. Killing time, while his companion’s chair remained undisturbed. The coffee arrived as he was busily steering his bots into the opening at the bottom of a drain pipe. He nodded thanks to the server as he swiped the screen, instructing the little creatures to form a bot pyramid, bracing themselves against one another and the inside of the pipe to climb their way upwards. It got trickier partway up, with part of the pipe crumbled away, but some careful tapping got his bots stacked neatly on top of one another across the missing section, then firmly putting themselves back in place when safely back in the pipe once more. Calvi paused for a moment to take a sip of his coffee. It was excellent, rich and almost strong enough to make him gasp. He glanced out of the window, at the crowds gathered outside, then set the cup down again to concentrate on his bots. It wasn’t long until they had reached the top of the pipe, and he navigated them into the gutter that ran along the side of the building they were climbing. From there, it was a simple piece of navigation to the rooftop itself. “Would you like to see the menu while you wait?” asked a helpful waiter. Calvi set the phone down, furrowing his brow as he looked at the empty chair next to him. “Sure,” he said, with a slight tone of annoyance. The waiter smiled at him sympathetically. Not the first person he’ll have seen stood up on a date, thought Calvi. He drummed his fingers for a moment, his attention caught again by the activity outside the window. The crowd was cheering now. It must be getting closer to the time for the ceremony to begin. Calvi picked up his phone again. The bots were sitting patiently where he’d left them, waiting for his instructions. He tapped them back into life, and off they marched, a tiny convoy of miniature machines, across the rooftop. Each had a slightly different shape, but all followed his instructions neatly and with ease. It really was a very well-designed app, Calvi thought. They reached the far edge of the roof, and the bots quickly swarmed up the parapet there. Once there, he opened up a sub-menu. A range of actions were available there, and he tapped the “Assemble” button. First, a quartet of bots at the front braced themselves against the parapet, while a group at the back formed a pillar for the others to rest on. Then, one by one, the rest formed a bridge, clicking into place until they started to form a familiar shape. A long tube formed, with a single bot inside, and another bot clambered on top, before lying in place with a click. A pop-up appeared on his phone screen, but Calvi set the phone to one side for a moment as the waiter arrived with the menu. He leafed through it for a moment, then ordered a steak, and a glass of red wine to go with it. He smiled and handed back the menu. Outside, the cheering had quieted a moment, as the crowd stilled enough for the speakers at the ceremony to be heard. Calvi returned to his app and tapped the pop-up. The bot at the top provided a camera view. Calvi found himself looking down on a square. A joystick control at the bottom allowed him to move the view around. With each movement, the pillar of bots at the back shifted position accordingly. Finally, Calvi was happy with the location. He was looking down at a stage, and as he watched, a man stepped onto the central platform, waving to the audience gathered there. With a tap of the button, the camera view became crosshairs. Calvi took another sip of his coffee and then, with the man located in the centre of the crosshairs, he tapped a red button on the screen. Outside the restaurant, the sounds of cheers turned into the sound of screams. Calvi glanced out of the window at the panic and horror as people ran, or pointed in shock at the ceremony platform. Satisfied, Calvi clicked the disassemble button. The bots slowly took themselves apart, breaking up the rifle they had been moments before. They would retrace their path, and later Calvi would pick up the box they had been placed in at the bottom of an old drainpipe. All but one, the one from the rifle barrel, which was now nestled in the heart of the president, where he lay on the stage outside. That bot was following its own programming, moving inside its target to maximize damage. Smiling, Calvi turned off the app, and finished the rest of his cup. It really was excellent coffee. I really enjoyed this and the POV being from such a calm and disinterested perspective. It was really well laid out, the scene set with enough hints but still surprising and even though there's little characterization he's very well thought out. I'd love to read something else by you. Thank you! Glad you enjoyed it. 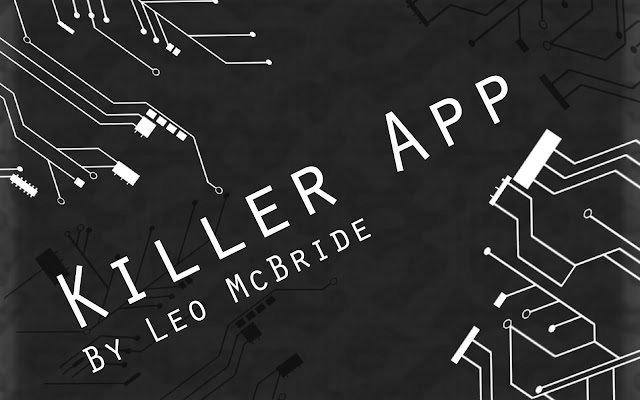 There are a number of other free stories on the website - or take the dive in on Amazon, where you'll find me as Leo McBride in a number of anthologies. Thank you for the feedback!